I don’t have any trouble transposing a simple tune with C, F and G7 chords into most any other key. When I was younger I used to be able to transpose more complex chords into most keys as I played. But I’m out of practice, or just older and lazier or maybe the brain cells are dying – but I struggle more than I used to when transposing a tune with complicated jazz chords to different keys. The good news is there is a lot of help available in software, online tools or smartphone apps to make this easy. First, let’s review the problem and the non-software solution to transposing. This section is for beginners so the rest of you can skip to the next section. I’ll use an example. Let’s say you have a piece of music with the following chords in the key of C.
Now let’s say you want to transpose this to the key of F. Why? Maybe you’re in a band and the horn player tells you that’s they key that works best for his or her instrument. Or maybe you’re accompanying yourself as you sing and the range of your voice fits the key of F better. It might even be that the chord shapes for the key of F fit the song better. In order to transpose this, you need to know the chromatic scale and how many steps higher or lower the new key is from the original key. We’re going from C to F. F is 5 notes higher on the chromatic scale. This is also said to be 5 half-steps higher or 2 full steps plus 1 half step 2. Lets line up the scales to see what this looks like. I can see that F is 5 notes higher than C by counting up from C to F on the original chromatic scale. To make it even easier, I can write the chromatic scale starting with F beneath the original scale that started with C. Then, for each chord you lookup the note name (root of chord) in the Original row and find the new chord in the New row. Everything after the note name remains the same. Here’s what this manual transposing looks like for our example. That wasn’t too hard was it? But there are easier ways if you need them. If all you have is the chords or chords plus lyrics for a song and you want to transpose them to a new key, there are free online tools which will easily and quickly do this for you. This is much faster than the manual method I showed above, but may not be as fast as doing it in your head on the fly if you’re able to. Google “transpose chords online” to find a tool. There are many. It’s best if you are able to copy/paste the chords & lyrics from a web page or a text document – but not essential. You can just type in the chords if you need to. Here are two online tools I’ve tried. The Tabulator. The Tabulator requires you to know how many whole and half steps the new key is from the original. 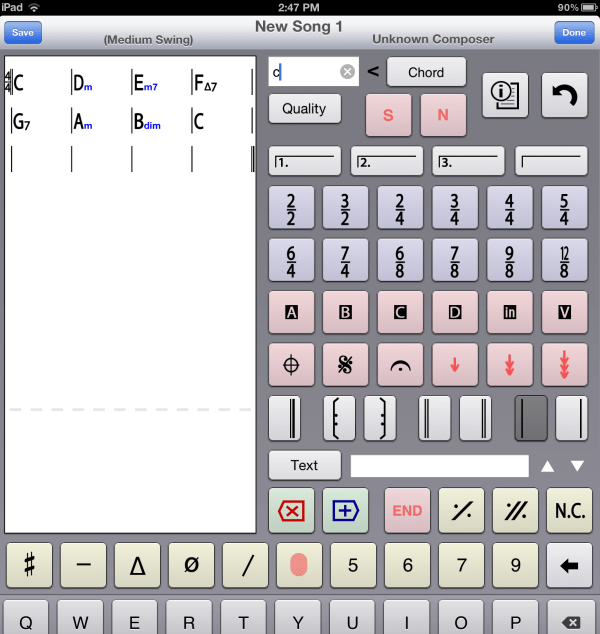 You can type or paste in chords, chords and lyrics or chords and ascii tab. 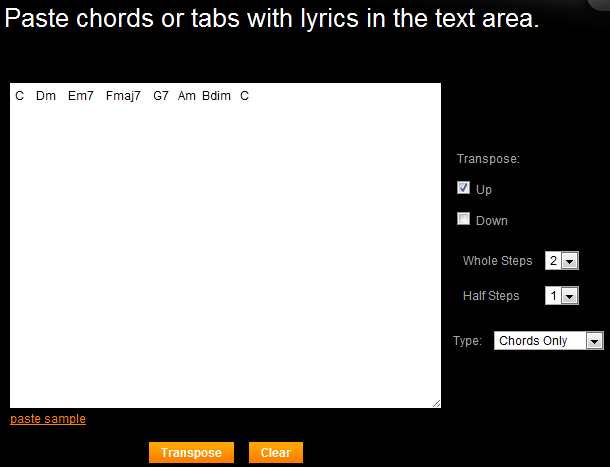 After you click on the transpose button you are shown the transposed and original chords. You can highlight the text of either so you can copy/paste it back into a document, or you can save the results as an RTF file (readable by most word processors). 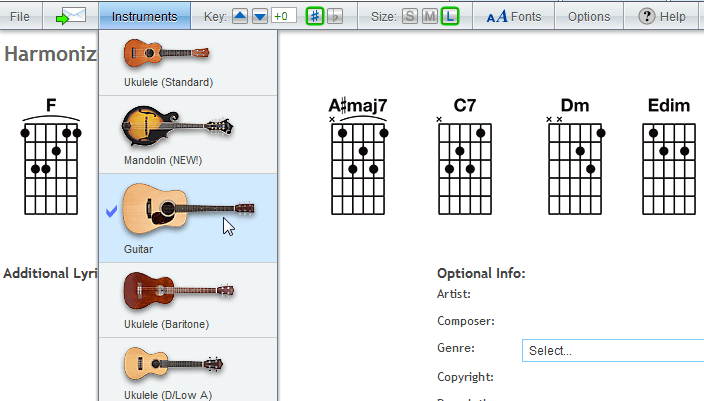 3 If you click on the New Window button you get the chords in a window where you can select the font. This window is traditional black font color on a white background. The first nice difference from the Tabulator is you can just choose the name of the original and new keys from drop down lists (Entered at the big red #2). You don’t need to calculate how many whole or half steps are between the two keys. In fact, the original key is optional. The tool will try to guess the key based on the chords you enter. You only need to give the final key (but you’re probably better off entering the original key if the first chord isn’t the same as the key). The big red #3 is a drop down list giving output options. Choose “Lyrics/Chords/Pictures” to get the following output. You get both the transposed chords and guitar chord diagrams. Very cool! If you wanted just text you could choose that from the drop down list instead. ChordPro output requires ChordPro input. GoChords. I just discovered an online service that allows you to enter chord diagrams for your songs, share them with friends and transpose them to different instruments or keys. You need to create a free account in order to use this tool. You drag and drop chord diagrams into your music. A limitation is that there is only one chord shape for each chord name. Also, more advanced jazz chords (extended chords) are not available in the default selection. Still, this is very easy to use to create a chord chart to a song. I’ve entered ukulele chords for the example shown. There are up and down buttons at the top of the window you can click on to transpose up or down. Each click transposes by one half step. Here’s the results when I clicked the “up” button 5 times to transpose to the key of F.
It is possible to create a library of custom chords – for all the alternate fingerings or missing advanced chords. However, when these custom chords are inserted into your music, they don’t transpose. If you want to transpose you have to use the default chord selections. If you only use the default chords they provide, you can not only transpose to a different key but you can display the chord diagrams for a different instrument. Again, this is pretty cool. Here’s the instruments that are currently supported. I’ve gone from the original ukulele to guitar. Note that if you’re into ukulele you can change from standard C tuning (GCEA) to D tuning (ADF#B) and to Baritone G tuning (DGBE). If you have tablature software or other music notation software, you probably already have transposition tools. However, they really aren’t the most convenient. 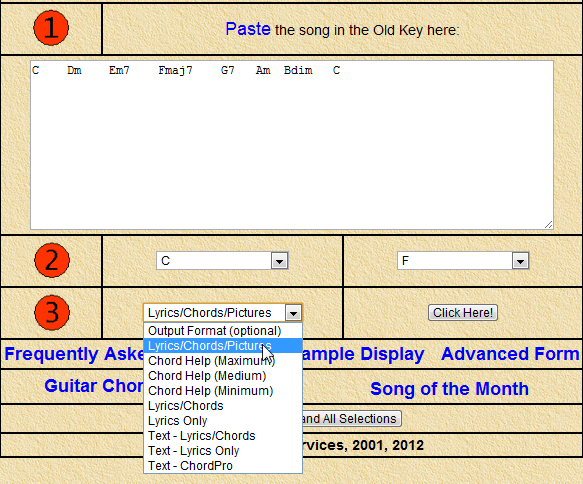 First, you have to enter tab and / or specific chords. 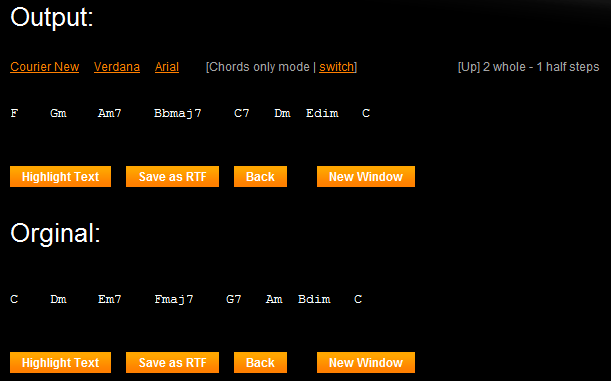 You can probably choose the chords from the chord manager. 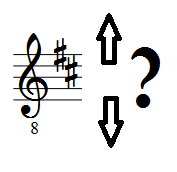 Transposing shifts the finger positions up the neck but doesn’t choose a different chord shape for a new open position chord. Overall, if you just want to transpose chord names, then tablature software is both overkill and yet may not be what you really want. If you use Band-in-a-Box (BIAB) (commercial software) or Impro-visor (free, open source software), you can transpose chords from those programs quite easily. I won’t review how here, but I assure you it’s easy. iPad Apps that Transpose Chords. I recently reviewed iPad music apps. Several of those can transpose chords for you. iReal b. This is an app that can play back a simple accompaniment to a set of chords you’ve entered or imported. You can choose the tempo and the key. Here’s some screenshots of entering a chord progression and then transposing it from C to F.
GoChords. 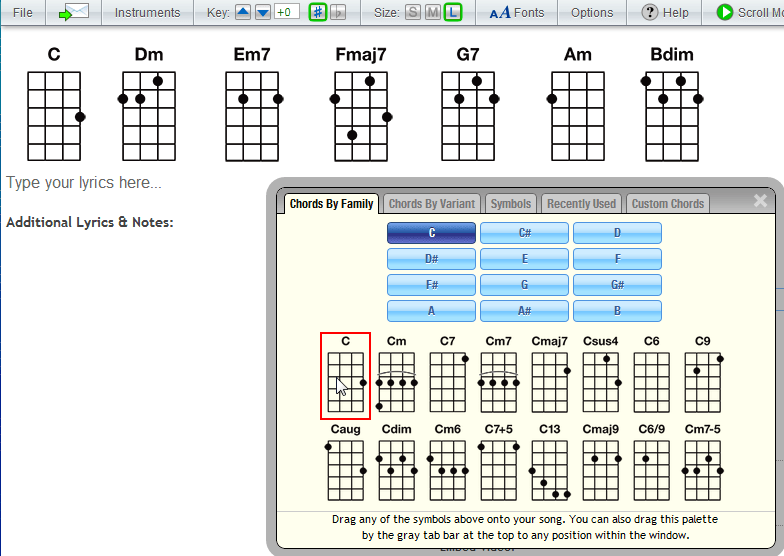 The GoChords online tool I described above is also available as an iPad app. Of course you could access it from your browser on your iPad, but using the app allows you to have your music when you’re offline. This example is more or less the harmonized scale in C.
Click on either tabulator example image to see an enlarged version of the image.